Developed by Edge of Reality. Published by Activision. Released June 24, 2014. Available on PC (reviewed), PS4, Xbox One. High Moon Studios impressed this particular Generation One Transformers fan with the release of Transformers: War for Cybertron. A passion project designed with a clear love of the classic Hasbro franchise, Cybertron married the original "G1" series to an all-original setting and artistic direction, producing a smart, solid, and thoroughly entertaining little adventure that rose above most cynical licensed videogames. Sadly, after the release of Fall of Cybertron, High Moon apparently isn't allowed to work on Transformers games anymore, and the association has ended for one of the few companies to produce a Transformers title that respected property and fan alike. 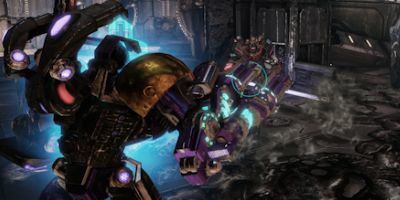 Of course, Activision had no intention of killing off the Cybertron license, and has now handed the IP off to one of gaming's prominent mercenaries, Edge of Reality. The result is a game that shamelessly revels in being everything War and Fall were not - cynical, lazy, and disrespectful. In a move that would be utterly baffling if not for the obvious answer (money money money! ), Transformers: Rise of the Dark Spark seeks to uncomfortably stitch the continuity of the Cybertron games to Michael Bay's critically despised series of movies. You know, those racist ones. It took me a moment to even remember that's what they were doing, since pre-release coverage of this game has been almost nil. In fact, I was quite confused when I first started playing the game and found myself in the steel chassis of a samurai robot with stereotypical Asian features, one that kept talking about honor as if that were an original sentiment. It was jarring as hell, and only got moreso once I saw recycled character models from the High Moon games appearing alongside Michael Bay's ape-like mechanical mutants. Jarring is the perfect word to describe the Dark Spark experience. The story, in its desperate attempts to marry two universes that were never designed to fit together, nor have any business doing so, is complete and utter nonsense. Something about a Decepticon analog to the Matrix of Leadership, Cybertronian mercenaries, and then Zombie Autobots because of some reasons. Characters are tossed in quickly and just as swiftly swapped out, with a plot that tries to tell several stories at once and never adequately fleshes out a single one. Things are somewhat acceptable while we're on Cybertron, mostly because the Insecticons are playable and feature prominently in the plot. Insecticons are awesome, and anybody who'd disagree with that sentiment is a war criminal who deserves all their writings burned. Even with the help of Sharpshot, Hardshell, and Kickback however, Dark Spark is an overwhelmingly dull experience, recycling tons of assets from the previous Cybertron games and throwing them into banal environments full of mid-90s era platforming segments, monotonous shooting sections with poor pacing, and tons of waiting around for doors to slowly open. On Earth, it all goes downhill. At least the Cybertron environment is visually interesting. The Earth stages are muddy, washed out spaces populated sparsely by uninteresting buildings, with player characters that look nowhere near as inspired as the designs Edge of Reality pinched from High Moon. What is truly sad, however, is just how stripped down this game feels compared to the last two. Gone are the memorable setpieces and grandly staged boss fights of the previous installments. The competitive multiplayer mode has been completely torn out, with only a smaller and less varied Escalation Mode remaining. Between the reuse of material and the lack of significant changes, Rise of the Dark Spark comes off as just another lazy, sloppy movie tie-in, closer to the garbage games Activision usually squirts out to accompany the latest Michael Bay flick. This release seems to exist solely as an excuse to save money by mashing all the preexisting Transformers game assets into one shuddering chimera, allowing for quicker and cheaper production of licensed products in future. I will admit, I like the leveling system, where gaining experience leads to random unlocks that include playable characters for Escalation, new weapons, and one-use special abilities. I also have to reiterate that I really, really enjoy the playable Insecticons, especially the extra animations given to their invertebrate alt-modes. These touches only go a small way toward making up for the overall dreariness of the experience. This is not exactly a technical masterpiece, either. Menus are horribly laggy, random loading times in the middle of combat break what little fluidity there is, while the piss-poor A.I. usually sees your allies blocking your path. It's also really common to get stuck on scenery as well, because what shoddy game would be complete without that old feature? Seriously, I have to wonder if anyone legitimately thought this was a good idea from any perspective that wasn't influenced by money. There's no artistic cohesion to this game - how can there be? The Cybertron and Earth plotlines don't really even have any relationship to each other, they just sloppily share the same stage. The uncoordinated elements of War for Cybertron and The Bayformers are shoddily welded on to one another with not even the slightest effort to so much as paint over the seams. It's like watching two games try to happen at once, or viewing a painting created by two people on one canvas. Two people who are fighting. And shagging. At once. I don't like this game very much. In other words, Rise of the Dark Spark is Edge of Reality laying a steaming hot turd on the grave of High Moon Studios' work, while Michael Bay and Bobby Kotick watch masturbating from the trees. With its gibberish plot and repetitive, unfulfilling combat, this regrettable little mistake serves only as a prime example of what happens when publishers miss the point of their own products and milk the teat dry. Bottom Line: It's lucky it has Insecticons, otherwise I'd have been really, really critical. Recommendation: Replay one of the previous games. This one is dull as ditch water and half as tasty.